The summer months on Fontana Lake provide anglers with a wide variety of angling opportunities. The diversity of Fontana is at its finest this time of year. Black bass species including smallmouth, largemouth, and spotted bass are all feeding heavily on crawdads and shad. When you see schooling fish breaking the surface cast into them with spoons, shad raps, or umbrella rigs. Try to match the size and color the best you can. The gizzard shad they feed on most commonly are typically two to three inches long or smaller. Walleye can be found deep with electronics where most anglers target them with down riggers and lead core lines. You can also target them with 1/8 ounce jigs tipped with a night crawler on windy points where the water and wind keep the water clarity stained with clay. Cast at the head of the point and walk the jig down the bank. As we get into the hotter months blue, channel, and flathead catfish can be caught on live baits and cut baits. Many anglers prefer to chase them at night. Blues and channel catfish will take just about any cut bait, where flatheads usually only take live bait. Lake run rainbow and brown trout can still be found around the mouths of rivers and creeks entering Fontana. You will see a lot of intense surface feeding on insects very early in the day and just before dark. 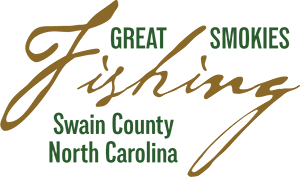 Several sections are Hatchery Supported Trout Waters for all three species of trout; look for the Wildlife Commission diamond signs posted on streamside trees to determine the fishing regulations. The Tuck is also a great stream to find brim, red eye bass and smallmouth bass and spotted bass. While you may not find as many smallmouth bass as you would in the Little Tennessee, generally what you will find is larger fish. This fall starting in October a section of the Tuckasegee River through Bryson City will be designated Delayed Harvest. It will provide excellent fall trout fishing convenient to Bryson City. If you plan to spin fish the Tuckasegee River during the summer, bring spinners, rapalas and mr. twisters. If you are planning to fly fish the river, poppers and streamers will be your best choice. The Tuckasegee can be waded or fished from a raft. There are several outfitters that offer guided float trip on the Tuckasegee. The Little T is considered to be one of the best smallmouth streams in the southeast, with an abundance of smallmouth. Add to that all the red eye bass and brim and you will rarely be bored. Make sure the water in the river is clear before you go. Be careful for afternoon storms. I have survived some exciting lightning storms on the river. If you get caught in one, get out of the water and wait a while. These storms usually pass pretty quickly. If you are spin fishing, you will do well with small rapalas and crayfish imitations. If you are using a fly rod, the most fun can be had with poppers and streamers. The Nantahala has two different sections for trout fishing. The Upper Nantahala has miles of great wade fishing water. It is stocked regularly by the NC Fisheries Department. Before the first Saturday of June it is a Delayed Harvest stream. That means single hook artificial, catch and release only fishing. On the first Saturday of June it changes designation to Hatchery Supported. Remember that until noon on that first Saturday only kids are allowed to catch and keep. After noon it is open to general fishing. The main stem of the Nantahala is considered to be one of the best tail water streams in the Southeast. There can be a lot of raft and kayak traffic on the river, especially on Saturdays. The river can be wade fished early in the morning and late afternoon, before and after the power generation releases. Be aware that the river can come up quickly. It is not a good place to get caught mid stream with waders full of water. Trout fishing is excellent through out the summer due to the cold water temperature. Water temperature varies from 65 degrees with the water off to 50 degrees during releases. The best way to fish the river with the water on is to do a float trip. Fishing it with the water on is a real treat. There are lots of rainbow trout to be caught and also the occasional monster brown trout. The state record brown trout has come out of the Nantahala two times. 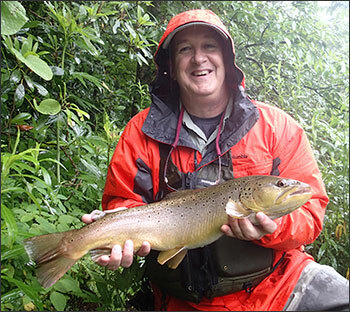 In 2014 a potential state record brown trout was caught and released. In order to register for a state record fish you have to kill it. Most guides will discourage this and release the fish back into the stream. Spin fishermen usually do well with small spinners and bubbles with a variety of flies attached to their lines. If you plan to fly fish, use small nymphs like pheasant tails, prince nymphs and tellico nymphs. In summer light colored dry flies like cahills, and sulfurs usually work the best. Blue wing olive dry flies are also a good option. Casting wooly buggers is a great way to catch big brown trout.